Much of the rock in the alpine garden is alkaline-rich limestone. 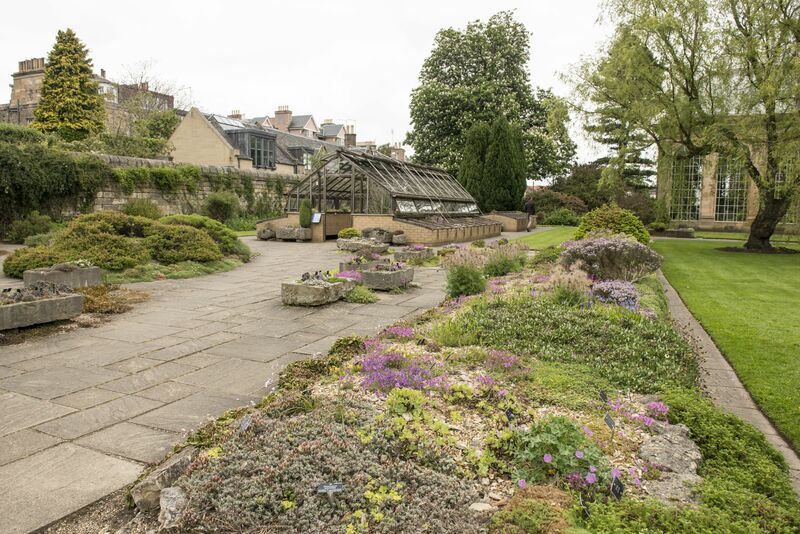 This supports a different community of lichens to those found in the rock garden which are more acid-loving ones. The limestone walls provide a wonderful habitat for a whole array of crustose (crusty) lichens, creating a patchwork of colour and texture that gives the wall character and an ‘aged’ look. The stone troughs provide perfect ‘micro-habitats’ not only for the many smaller or slow-growing plants but also lichens. Growing on top of a rock in one of the stone troughs is a cyano-lichen (fungi has cycanobacteria instead of algae as its partner). 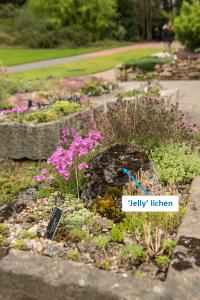 These nitrogen-fixing lichens are sometimes known as ‘jelly’ lichens. Lichens don’t need soil – they can grow on bare rock and on branches at the tops of trees. They capture the nutrients they need from the atmosphere. Experiments have shown that lichens can capture up to 95% of nitrogen deposited in rainfall. Nitrogen is a ‘limiting factor’ in many ecosystems; there’s simply not enough nitrogen to go round. As well as capturing nitrogen from rainfall, some lichens can convert (fix) nitrogen gas (N2) from the atmosphere into a form that plants and animals can use. Because of their effectiveness at capturing scarce nutrients, lichens are extremely important in primary succession (the early stages in ecosystem development) and in the nutrient balance of oligotrophic (nutrient-poor) ecosystems.